I’m going to do it this time. I have my alarm set and I am committed to getting up early to have that sacred quiet time other moms talk about. I am going to sit in the quiet and read the bible and sip my coffee, this is going to be glorious!! Okay, I am getting to bed a little later than I had planned. I can still get almost seven hours of sleep if I fall asleep soon. Lots of people get less sleep than that and function. Still awake. Maybe 6:30 would be better. That’s still early and I will be more refreshed with that extra half hour. Tonight, I will go to bed early and get up early! Maybe I will even have time to work out AND have quiet time! Ambitious as the last line sounded, that is me so many mornings. I am a morning person in theory. I love the idea of getting up before everyone else in the house and spending time in God’s word and listening to music and writing in my journal. It sounds so picture perfect. The reality is, I have one child who is actually a morning person and likes to be up before seven―even though he doesn’t leave for school until 8:30. If I had my way, I would get up at 7am every morning and there would be one glorious hour where no one else was awake and I had quiet time. Getting up before 7 is hard for me. To be considered a morning person you only need to be alert and productive in the early hours of the day. There is no time in which you have to be awake to qualify (except that it should be before noon). But we all think of a morning person as one who is up before the sun and does it with ease. 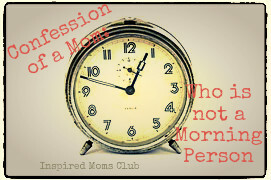 The truth is that we can all be morning people in a loose sense of the word. If you can chose joy in the morning no matter when you like to greet the new day. Maybe you roll out of bed after 9. That’s okay, choose joy! If you have kids who often times determine your waking hour, rejoice! They may be an obstacle to your happiness in that first fleeting moment, but chose joy! The week after our prayer and fasting through church was done, I decided to keep the routine of getting up at 6am for as long as I could. Wouldn’t you know, the Monday of that week, all THREE of my children were up by 6:18am?! I was livid. WHY!? HOW!? I put joy aside and picked up indignation…and not the righteous kind. Instead of laughing at the attack on my new-found routine, I succumbed to the frustrations of having the “I needs” flying at me before the coffee could finish brewing! Okay, so if I’m not a “Morning Person” by common definition, how do I become one? I choose joy in the morning. I like to have God’s word written in areas I will see in the morning. That way, if my quiet time is nothing more than the 10 seconds it takes me to pop my contacts in, at least I will have my mind brought to the best place possible: God’s Word. Also, I know that this season will not last forever. In the not-so-distant future, I will be soaking in the hours of the weekend while my teenagers sleep past 7, 8, maybe even 9 o’clock . I will get a full cup of coffee in my system and probably an entire chapter of Mark before I have to go poke the growing people out of their slumber and convince them to carpé the weekend! I am living in a to-go sized portion of the Word and quiet time and that is okay. I make time when I can and it just doesn’t have to be at sunrise. The ocean of grace is deep for parents raising little people. We are pouring out almost faster than we can be filled up. The plain truth is that this just won’t last. God knows it and I know it too. Grace, sweet Mamas. Grace. That said, if you are dry and hungry but just not a morning person, take a good hard look at your day. Ask the Holy Spirit for divine inspiration as to when you can best fit God in your day. It may be at nap time, lunch time, or it may be at night. Don’t mistake the morning as the holiest of hours. There is beauty in searching your heart and giving God the most attention he can be given. And if that is at the end of the day, trust that God knows your heart and he knows if you are simply pushing him off until the end of the day, or you are honestly giving him the most secure position of the day. I am all across the board. I do morning quiet time as often as I can and it is not always quiet. I have learned to shut out the chatter of kids, early mornings and get at least 10 minutes where I am sitting and reading the word and (maybe) journaling. If I can get more time later, great! If not, at least I grabbed a quick slice from the bread of life! I’m not surprised that your kids got up early in the morning once you made a commitment to see God. I believe that when we commit to serious prayer and reading the word that the enemy of our souls will pull out all the stops to keep us from doing it. It happens to me all the time. If it’s not the kids, it’s the dogs, or some crisis, or whatever. He will do anything and everything to keep us distracted, but don’t give up! Remember you’re struggle is really with spiritually dark forces, so put on your armor (Eph 6) and keep at it! !